Build trust and understanding by facilitating interactions between team members as they pool their collective insights to create a short, mutually understood, prioritized, and actionable list of the current issues . Identify this year's focus on status quo changes to accelerate motion toward the shared visualization of the future. Incorporate Middle Management's input and establishes their accountability for implementing this year's strategic plan. Sustain commitment and implementation with at least two midcourse review meetings that refresh this year's strategic plan. 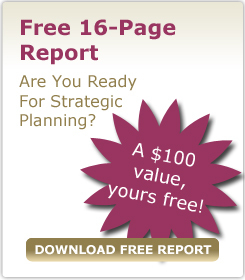 Does your organization want to accelerate the implementation of your strategic plan? Do you have a 5- to 12-person Senior Team motivated and able to devote three intense days for the annual planning meeting? Do you have 12 to 30 Middle Managers motivated and able to devote one intense day to developing specific action plans they are accountable for? Are you able to commit the Planning Team and Middle Managers for at least two additional days during the planning year for one-day review meetings to account for progress, and refresh the plan? $23,800 fee*, plus expenses, for Myrna Associates that covers the use of our process, processing of pre-annual meeting input, facilitation of the three planning meetings, preparing the Microsoft Word and PowerPoint documentation, creating and shipping planning notebooks with CDs for the Senior Team, and emailing of midcourse revisions to the plan.